Material and Finish: Steel posts painted white with wood top rail. 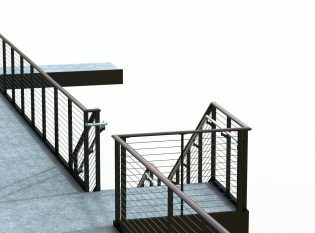 Description: Interior staircase and balcony cable railings with ADA-compliant handrails. Glenn Dasher of Dasher Hurst Architects approached us about fabricating a cable railing system for the new the new Jacksonville University College of Health Sciences building. Dasher’s design includes a two-story linear atrium that runs the length of the building and features clerestory windows that bring daylight into the interior offices and corridors. An indoor garden with a cascading water feature also brings the outdoors into the interior of the university building. The architect chose our Ithaca Style cable railing for the staircase and balconies to give the space a modern aesthetic. This railing design uses our thinnest railing posts and has clean, simple lines. Additionally, Keuka Studios fabricated stainless steel ADA-compliant graspable handrails for the staircase. 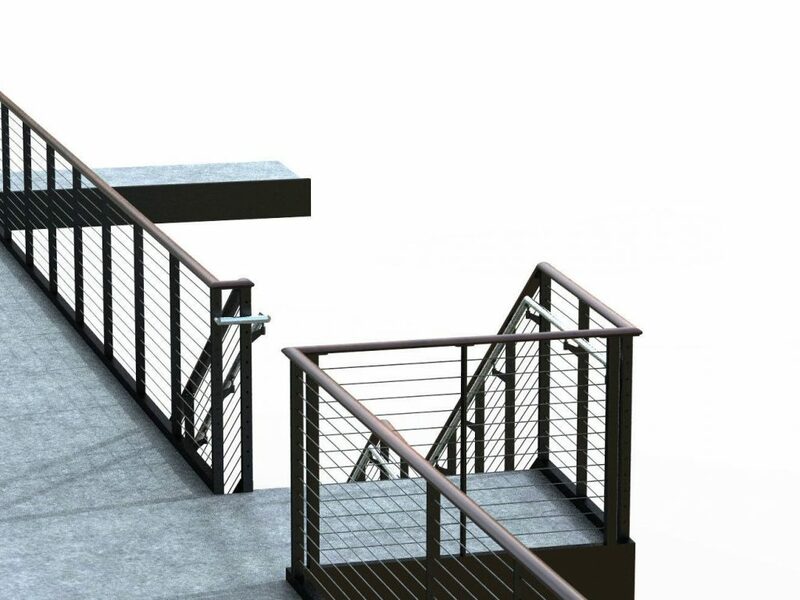 The handrails enhance the look of the cable railing while meeting the commercial building code requirements. Our fabrication process began with designing and rendering the project to help the architects, builders, and stakeholders review the designs and approve the project. Keuka Studios uses this approach so that with every project we can ensure that everyone involved understands the intent for the finished product. During the rendering process, we can experiment with various colors and finishes to help decide on the finer details. In this case, the builders decided to paint the steel railing posts white on location and finish the railing with a solid maple wood top rail. The completed railing system now has a clean and sophisticated look and it fits perfectly with the light and airy feel of the surrounding space.